This is Part 3 of a 3-part series on critical thinking. You can find Part 1 here and Part 2 here. So how did you do? Did you get the number of passes right? Did you see the gorilla? This test was done several times to different groups of people and the results are that 50% of the people reported NOT seeing the gorilla. You see, your mind works very selectively and tends to focus on certain things, while not paying attention to other things. The most extreme example of this is called inattentional blindness, which is demonstrated by the experiment above. The mind has a limited capacity for paying attention. In some individuals it can be greater and in some smaller, but the end result is that it is always limited. You need to be aware of this, when thinking and coming up with conclusions. You need to keep in mind that your perception is limited and so the best way to approach problems is to keep an open mind. The way that humans understand reality involves taking something that exists in the outside world and interpreting it in order to come up with a certain conclusion. You start off with your senses (sight, touch, smell, sound, taste) taking in different things from the outside. 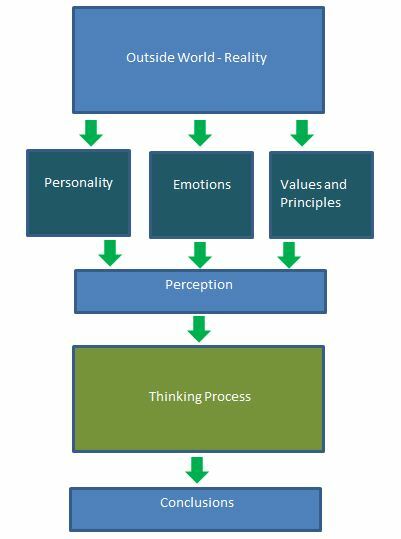 These are then put through some filters (such as personality (meta-programs), emotions, values and principles) to form your perception of these things. These perceptions then serve as inputs into your thinking process. This involves the synthesization of your perception of reality. Based on this synthesization you come up with ideas and conclusions. System 1: which is fast, intuitive, subconscious, where your emotions serve as a major source of input and which often uses heuristics to come to conclusions. System 2: which is slow, but more logical and uses reflection in order to consciously come up with thougths and conclusions. The main difference between the two systems is that System 1 is intuitive, while System 2 is deliberative. The two systems are of course linked and feed each other. System 1 especially relies on associative memory, which then forms the core of heuristics, and fast decision making. Here feelings and impressions are the main inputs. System 2 proceeds in a slower, more step by step fashion. It also more actively engages your long-term memory and searches through the different things you have stored there. System 1 is more prone to making errors, but this tendency can be lessened through experience and deliberate practice. That’s where the 10 000 hour rule described by Malcolm Gladwell in his book “Outliers” comes from (the rule is based on work done by psychology researcher Anders Ericsson). Experience lets people automate certain tasks for which normal lay people usually need deliberate thinking. Let’s use the example of chess. Chess masters use System 1 when playing chess, since after so many hours of playing and practice, they have developed a skilled intuition and heuristics. On the other hand, normal people use System 2 for playing chess and have to deliberately think about the moves. Experts (whether in science, music, or sports) have a different way of thinking and doing things, which they developed through countless hours of practice. They see patterns based on past experience, which makes them much more likely to be accurate. Experts can use heuristics to their great advantage, while a person who is not an expert in that particular area is more prone to fall prey to logical fallacies. However this does not mean that being an expert in one area prevents you from falling for similar logical fallacies in other areas. The mind often thinks through the help of mental models. It has categories of different things and has assigned different norms and examples to them. For example, you have mental norms and examples for things like horses, dogs, chairs, police officers, carpets, houses…etc. In your mind you have representations of these stored and can recall them in order to make sense of the world. This works well for objects, but not so well with social things. It is very easy for the brain to do this type of modelling with material objects, however harder to do with ideas and concepts. This can lead to caricatures and stereotypes. In order to explain how the mind thinks of social things, we can go back to the notion of an ideal type. This was a concept advanced by Max Weber, a German sociologist. He proposed that in order to understand social phenomenon, you should construct ideal types of them. Basically you construct them through picking different elements and characteristics of a social phenomenon, combine them and create an ideal type. This is an abstract, hypothetical representation of the phenomenon you are trying to study. It is a fiction created in order to try to better understand what is happening in the real world. With social things, the brain often works in a similar way and creates its own ideal types of different social things. For example many people have mental models of what democracy is, what an American is, what a Muslim is. These often do not correspond to the real world (since there are many different kinds of democracy, Americans, Muslims…etc. ), but are just mental amalgams. These are the basis of stereotypes. Based on these stereotypes, people often start making assumptions and reach different conclusions. These stereotypes are usually further reinforced through different logical fallacies, such as availability bias and confirmation bias. All of these can lead to faulty reasoning and flawed conclusions. When thinking and coming up with conclusions, your mind can work in two major ways: inductive reasoning, deductive reasoning. The conclusions to a problem come out by using a certain logical process. There are some premises or assumptions at the beginning and then the brain uses them and processes them. With inductive reasoning, you pass from a specific observation to a general principle. So you go from a particular instance to a generalization. For example, you observe that all the swans that you have seen are white, therefore you induce that all swans in the world ever are white. See how you went from a specific observation to a more general principle? Especially science works using inductive reasoning. With deductive reasoning, you go in the opposite direction. You go from a general principle to a specific statement. It is a top-down logic, with the general principle being the assumption you make. For example, you start with the initial general premise that all men are mortal. Then you take another premise: John is a man. Deductive reasoning then means you go to a more specific premise deduced from the initial general premise: since John is a man, therefore he is mortal. With each type of reasoning process, you can introduce different fallacies, which can then cloud the conclusion. The problem with inductive reasoning is that your mind draws conclusions from only a limited set of observations. 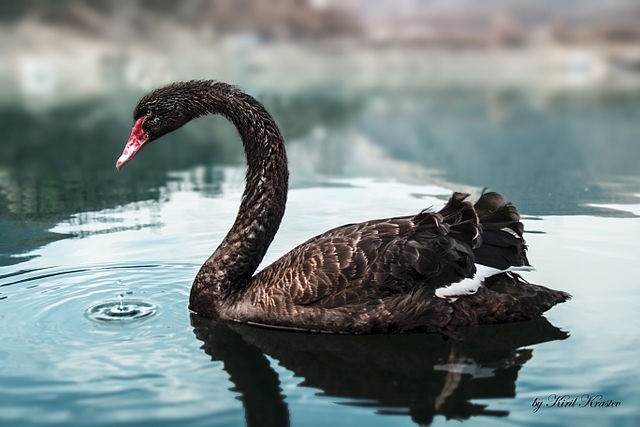 For example, you might live in the UK where all swans are white, however somewhere on the other side of the world there might be a population where the swans are black. Inductive reasoning can result in different types of biases such as the availability bias, confirmation bias, as well as a distorted, limited view of the entire problem. Deductive reasoning has its problems as well. Here the main problem will be with the initial assumptions that you make. If you make an incorrect assumptions, then the entire deduction is wrong. For example, your initial premise is that everyone who eats meat is a football player. Then the second premise is that John is a football player. Using deductive reasoning, you could then make the statement: since John is a football player, therefore he eats meat. However this type of generalization can result in the wrong argument. John can be a football player, but maybe he doesn’t eat meat. The initial premise was wrong, making the entire argument flawed. Deductive reasoning can often fail, if the basic assumptions are based on different stereotypes and caricatures. Unfortunately most people reason using these flawed assumptions and processes. So far we have neglected to go into detail on one of the biggest clouds on reasoning: your emotions. Your emotions are a huge factor on how you reason and come up with conclusions. Emotions are at the core of System 1 thinking and are also one of the major sources of logical fallacies. For example the affect bias is due to emotions. Emotions as leaders of thought are sometimes necessary, for example the emotion of fear in some cases can save your life, but in other cases they lead to flawed thinking, bad conclusions and unecessary drama. Emotions have deep power over thoughts and can sometimes even inhibit thinking and the rational thought process. When people are emotional their critical thinking capabilities decrease exponentially. This leads to rushed and unwise decisions. Research indicates that especially women have a tendency for emotional thinking. I do have to admit that I have also met a bunch of guys that give these types of illogical arguments a run for their money. So the tendency to fall for cognitive biases is strong among both men and women, although maybe the mechanisms in some of them might be a bit different. This does not mean that all emotions are bad. Emotions evolved in order to simplify and quicken the response processes based on outside stimuli. They are meant to push you to do a certain action. For example, if something scares you, you are supposed to run away. If something makes you happy, then that is a cue to continue doing it. Emotions drive our survival instincts and can often be of enormous value. However on the other hand, they can also be a source of illogical actions and thoughts. Emotions can help us make quick and decisive decisions, which are good, but they can also push us to make decisions which can in fact harm us. The key is to distinguish between the different instances. In order to come up with correct conclusions, you need to think correctly. How do you think correctly? You need to engage in a process called metacognition. This is basically thinking about thinking. You need to be aware of how you think and why you think that way. You should always be aware of your biases and how they can affect the conclusions you make. Go a bit behind and become aware of your motivations. Emotional intelligence is also important here. It’s a skill which involves understanding the relationship between motivations and decisions. You can also combine this process with epistemology or the study of knowledge, what it is and how it is acquired in order to be able to fully understand how you think and how you acquire knowledge. How do you know what you know? 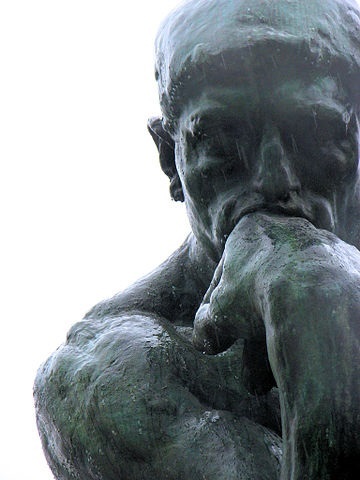 What do you need to do in order to be a critical thinker? What assumptions am I making when I make my argument? What “evidence” am I actively discounting and which am I relying on? What arguments are based on facts and which ones on opinion? Am I being intellectually honest? In order to come up with a good decision, you need to be aware of the assumptions you are making, the preconceived notions that you might have, and the heuristics and logical fallacies that you are using to come up with the conclusion that you will base your decision on. There is also a second component of this. You can use the fact that humans are prone to logical fallacies to your own advantage. You can construct your argument in a way as to exploit the logical fallacies that people make. Marketers and advertisers do this all the time. They take advantage of the different fallacies such as the framing effect, availability bias and anchoring effect in order to sell you a product. Now that you are aware of this, you can protect yourself from cheesy marketers and not fall for their tricks. You can also construct your own arguments, negotiations, marketing or anything else in such a way as to take advantage of logical fallacies in others and maximize your own chances of success (ethically of course). 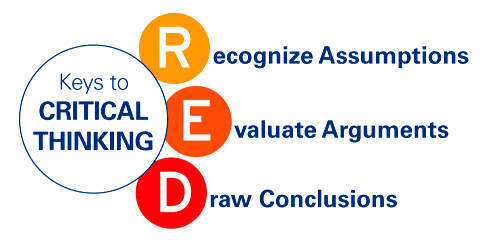 There is a framework developed in the 1930’s by Goodwin Watson and Edward Glaser to evaluate critical thinking. It is called the RED Model and you can use it in order to evaluate whether the arguments you or someone else is using make sense. Humans fall victim to delusions all the time. This results in flawed thinking that invents its own reality. Some people are not even interested in the truth, just in having their “side” win. Many people are quite comfortable in their ignorance and biases. A Renaissance Man is foremost concerned with finding the truth and being a critical thinker is a very important component of that. You will be using your awesome arsenal of knowledge in order to arrive at the truth, but also to win arguments. Combining different things and coming up with patterns is a very crucial part of that. However this process needs to rely on critical thinking. Click here to go back to Part 1. Click here to go back to Part 2.